SRINAGAR: The death toll in the ongoing operation to flush out militants from Sunjwan military station here mounted to nine as army on Sunday said that five soldiers, a civilian and three militants have been killed so far. 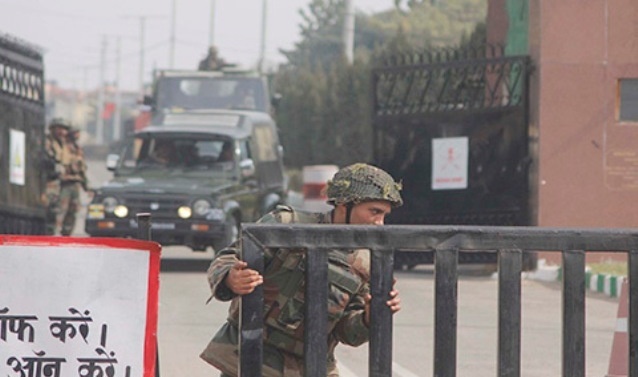 Briefing media persons outside the Sunjwan military station Army’s Jammu-based spokesman lieutenant colonel DevendraAnand said, “Three militants have been killed in the operation that has been going on since Saturday morning inside the army station”. “Two JCOs, three soldiers and a civilian who was father of a soldier, lost their lives,” he said and added that all the slain five soldiers belonged to Jammu and Kashmir. The spokesperson identified slain soldiers as: subedarMadanLalChoudhary of Hiranagar, Kathua, subedar Muhammad Ashraf Mir and havaldarHabibullah Qureshi both from Kupwara, Manzoor Ahmed Deva of Quazigund, Anantnag, nayak Muhammad Iqbal and his father from Tral, Pulwama. “We have killed three militants in the operation,” he added. “All of them were wearing army fatigues. Search and sanitization operation is still on inside the camp. AK-56 rifles, under-barrel grenade launcher, ammunition and grenades have been recovered from the slain militants,” lieutenant t colonel Anand said. Eleven other people, including six women and children were injured in this attack. The injured were identified as lieutenant t colonel Rohit Solanki, major Avijit Singh, lance nayakBahadur Singh, havldar Abdul Hamid Rashid, ParamjeetKour relative of MadanLalChouhdary, Neha daughter of MadanLalChoudhary, Somati Jena son of havldar. Haripoda Jena, wife and daughter of havldarSatyendar, subedarRajinder Singh and wife of riflemanNazir Ahmed. “A 14-year-old boy with a gunshot wound in the head, however, is critical,” he added. However, he dodged the question regarding possibility of more militants being holed up inside the military station. “The operation is on and the evacuation (of people from the family quarters) is in progress,” h e added. He said a number of families were still in the camp and the Army’s aim was to ensure their safety. “There has been no firing since last night,” the officer added. A source said four to six specialized firefighting and rescue vehicles of defence ministry were also rushed to Sunjwan military station as a precautionary measure to douse the fire in the residential complex. Meanwhile, authorities have ordered closure of schools in Sunjwan belt till the operation is called off. “Both governments and private schools within the radius of 500 meters of Military Station Sunjwan would remain closed on Monday,” said additional deputy commissioner ArunManhas. It may be recalled that a group of heavily armed Jaish-e-Muhammad militants had entered the Sunjwan Military Station base station around 4.55 am on Saturday. The militants, according to the sources, managed to enter the Junior Commissioned Officers (JCOs) quarters inside the camp while everyone was asleep. Para commandos from Udhampur were airlifted to ‘flush out’ the militants. The Air Force provided aerial surveillance. Meanwhile, Indian Army chief BipinRawat arrived here on Sunday to review the ongoing operation at the Sunjuwan camp.